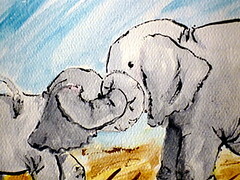 I adore your elephant painting!! My mom collects elephants so I love them because I love her. I’m glad you were able to post. I’d been wondering how you guys were doing! Ooh!! And I was thinking about NOT cutting my hair – now I want to again! Love your cut. I know what you mean about the styrofoam balls, we broke a wooden egg that makes noise when you shake it – filled my kitchen with teeny tiny (seriously <1mm diameter) metal balls. This was a year ago. I still find balls!! At least they aren’t static-y…! It is a great haircut – it is one I often find myself returning to as well. Once I had blueberry hair – Tim was teasing me about it just last night. Oh you look sassy!! I love it. You wear that style great. I love their paintings, they are doing a great job. You are very brave to cut your own hair. It looks great! Really! Oh I absolutely love that look on you!! I remember last year when your hair got to heavy…or was that the year before??? They go by so fast!!! LOVE your hair! It’s pefect on you!! And love those elephants. I used to collect elephants, don’t you know. Rather, elephant figurines, earrings, etc. You know, my favorite pair of earrings were hand-watercolored elephants on thick paper, coated in sealer, with an earring back attached. Have you ever made jewelry out of your artwork? Cute hair! Laundry is neverending, isn’t it? Fortunately, we don’t have quite enough clothes to let it go too long. The boys start complaining about having no pants to wear after just a few days. Which encourages them to actually hang them up — or at the very least, carry them to the laundry room. Hm. Would colorful hair be a good Valentine’s Day present for Shamus? Would he color his too? Would the kids want fun hair to match, and could this cause problems? Sadly I’m stuck having my own hair color, even though where I live is non-traditional enough that I can be an adult male with long hair.